A young man living in Agrabah. He helped Sora defeat Jafar and used his last wish to release Genie from the lamp. Aladdin asked Sora and his friends to help save Jasmine, who has been abducted. A young man who lives in Agrabah and dreams of meeting Princess Jasmine. Aladdin became Genie’s master when he found the magic lamp. At first Aladdin wanted to become a prince and impress Jasmine, but in the end he gave Genie his freedom and decided to show Jasmine his true self. A young master of the Agrabah street life, both kind and clever, Aladdin is always seen accompanied by Abu, who almost as often gets them both into trouble. He met Genie and Carpet in Kingdom Hearts, helped to defeat Jafar, and won the heart of the princess Jasmine by the end of it. A year after those events, Aladdin has grown tired of his life among the upper class, and to relieve this boredom, he immerses himself in the streets of Agrabah, to the worry of Jasmine. He meets Sora, Donald and Goofy after having failed to steal a black lamp later revealed to the one hold Jafar captive. Aladdin leads them through the Cave of Wonders when they are forced to obtain treasure in trade for the lamp. He fights alongside Sora against the Volcanic Lord and Blizzard Lord, putting his speed and agility to great use. Aladdin runs into Sora, Donald and Goofy during their second visit within the now-lavishly-decorated Peddler's shop, having chased Abu there. He reveals that the Peddler let Jafar out of his lamp, and turns an interrogation onto Iago, who soon reveals he knows Jafar's current whereabouts. When they all enter the mysterious but empty tower within the Sandswept Ruins, Aladdin is the first to turn on Iago, who reveals the mere distraction this has so far been. Sora fights Jafar alone, and afterwards Aladdin is able to forgive Iago once more. 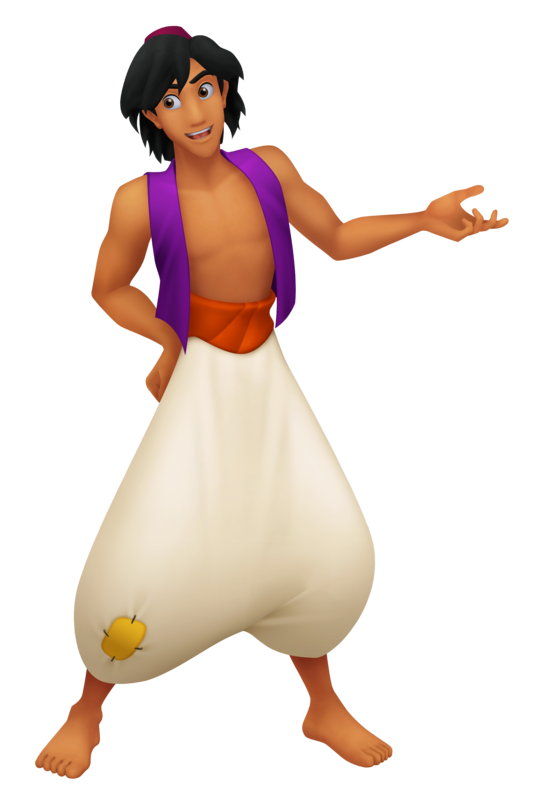 Aladdin is a young man who was a former ally to Sora in Kingdom Hearts. In Agrabah, Roxas finds Aladdin discussing recent sandstorms to Princess Jasmine. Aladdin believes that the source of these devastating sandstorms is the Heartless which concerns himself and Jasmine. He is ready to do anything to save the well-being of Agrabah.